It’s time to eat! You have been waiting to grill your massive steak over the fire since you picked it up from the local butcher shop. Now, the meat is done! You are so hungry that you dive right into cutting it only to find out that its not as tender as you thought it would be! So, what went wrong??? I bet it had something to do with how you sliced it. How you slice your steak is a very important part of the process. It can truly make or break your eating experience; and leave you thinking that something was wrong with the meat or how you cooked it. Post sponsored by Ace Hardware & The Grommet. All thoughts and opinions are my own! 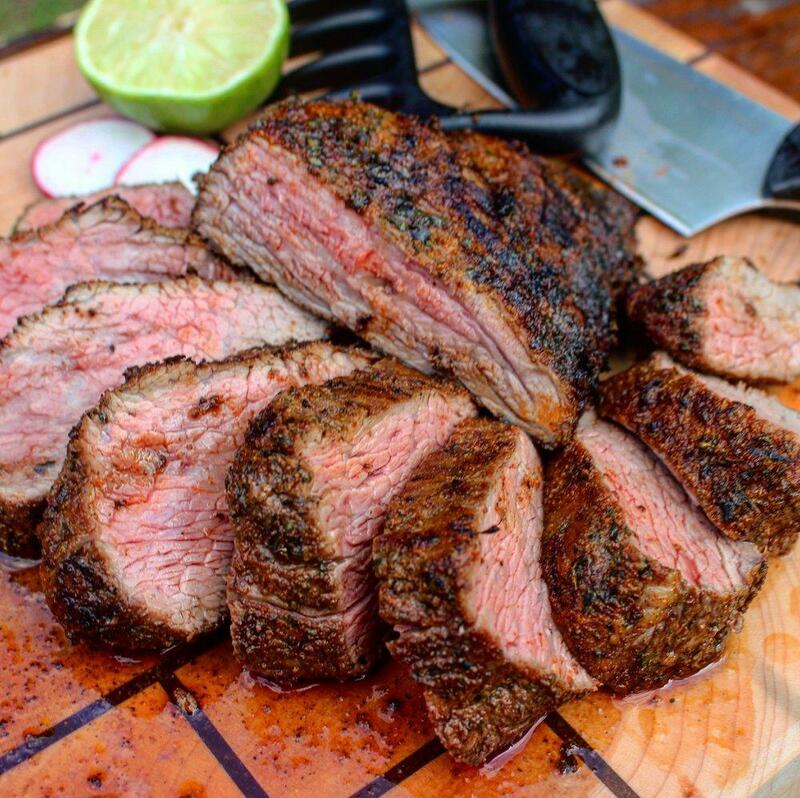 Tri-tip sliced and ready to eat! Most personal steaks like ribeyes, sirloins and filets are not supposed to be sliced until served. However, steaks like flank, skirt, picanha, tri-tip and brisket all need attention to detail when being cut. Having sliced steak the wrong way enough times to learn my lesson, I have gathered some tips to make sure you get the most out of your perfect cut of beef. While some might overlook where they slice their meat, I think that this is the most important part of the process. When you start to feel cramped with space, then you begin to make errors in your slicing. 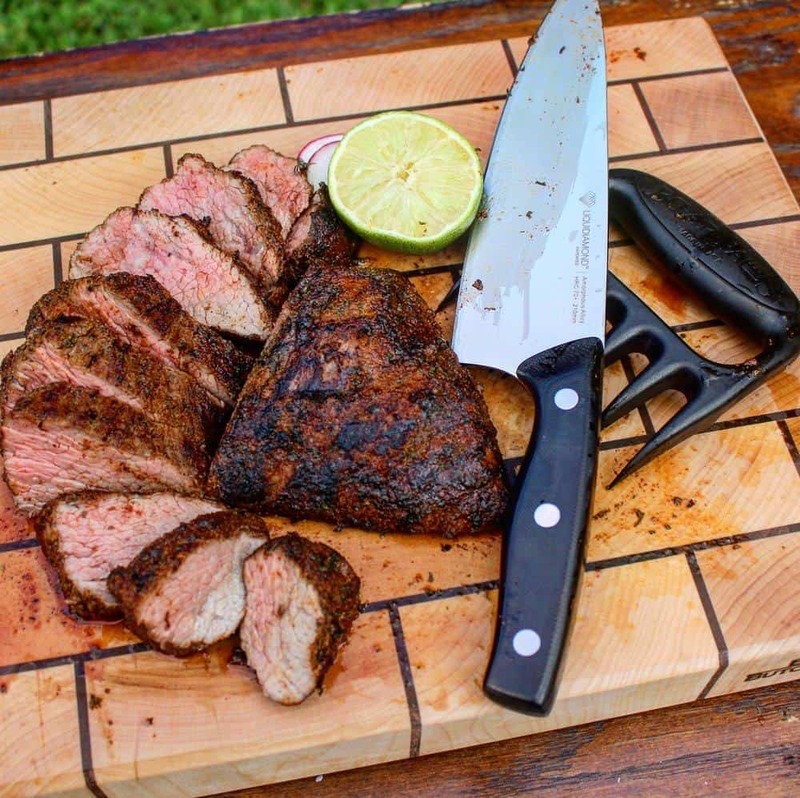 Get a large cutting board like this one from Brooklyn Butcher Blocks found on thegrommet.com to help solve that problem. 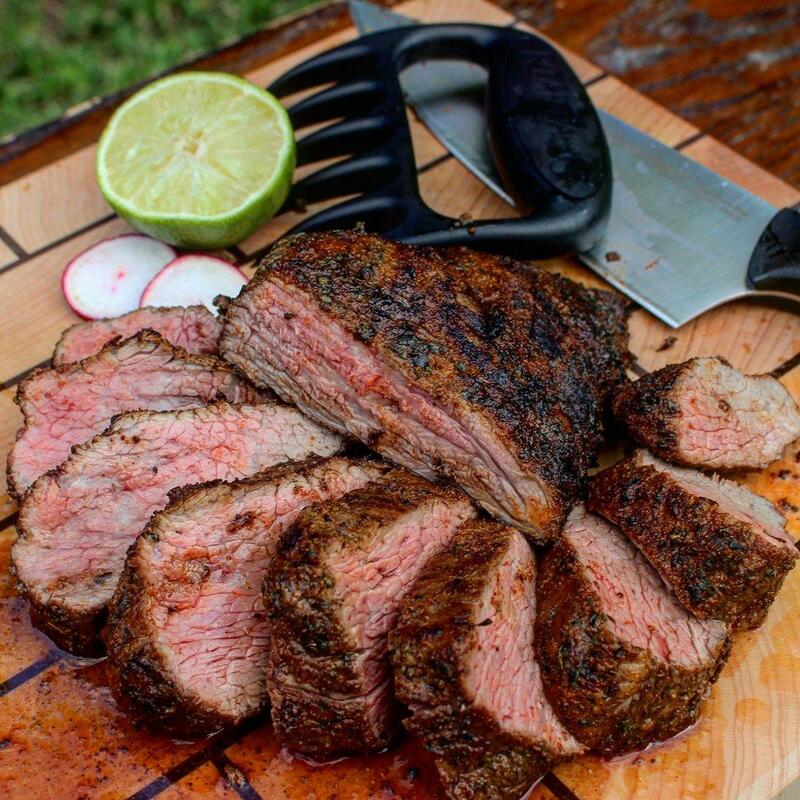 A solid wood cutting board will allow you to confidently slice into your beef with enough room to maneuver. Plus when you have multiple pieces to work on, It helps having a large cutting surface. When you have completed one skirt steak, then you can push it to the side in order to slice up whatever deliciousness is next. Safety in the kitchen is of utmost importance. Knives are always an area you need to be careful. However when it comes to knives, the safest knife is a sharp knife. Meat is notoriously difficult to slice as it is tough, thick and slippery. It’s important that you make sure you to have a sharp knife! There are a few fantastic selections found on The Grommet. They will alleviate the stress on your muscles from sawing into a steak with a dull blade. Moreover, make sure you have a knife that is the right size and shape. Curved edged blades are great for skirt, flank and bone-in pieces; while flat blades glide easily through brisket and tri-tip. If you are worried about your hands being close to a sharp knife then go to The Grommet and get some Bear Paws. These multi-purpose shredding tools can help keep that meat steady without risking your fingers. Whatever you decide, just make sure to be safe and keep your knives sharp. I am going to put this tip in all caps! It is super important. Each piece of meat has a grain which will run in the same direct. Slicing against the grain can be the difference between a tender and a tough steak. The best example of this is skirt steak. You can find the grain of the meat by looking at its ridges and internal lines. Cut skirt steak WITH the grain and it will be tough & difficult to chew. Slice against the grain and it is so tender that is will melt in your mouth. Both the same cut of meat, but two completely different experiences! In the end, the best tip for slicing your steak is knowing the right way to do it. Not all cuts of beef are the same. Some have different methods of slicing in order to optimize the flavor of the meat. Luckily, The Grommet has your covered to slice your steak correctly. I will leave you with this: find the best way to slice up your steak before diving into the process, because you only have one chance to make it perfect.